Incredible Maine did a great story on Mt. Marie in 2011. It is a full episode lasting 28 Min, hope you have the time to watch, it is our story, and provides some great educational material as well! iM 603 The Treasure of Mount Marie from Dave Wilkinson on Vimeo. Mount Marie is located in the scenic rolling hills of western Maine near Streaked Mountain in Paris, Maine. The mountain was named after the first company of record to mine here, Mt. Marie Mineral Co., which was formed in 1902. During the first half of the 20th century several mining companies attempted to work Mt. Marie for commercial feldspar to be used in the ceramics industry. However, the limited quantities of high quality “spar” and/or other minerals of commercial interest failed to sustain any long term operations. Today, Mount Marie is dotted by numerous small quarries and prospects as a result of these early mining endeavors. Throughout the 20th century, there had been occasional mention of the occurrence of colored tourmaline at Mount Marie, but no notable samples of faceted gems are known to exist from this early mining. However, for reasons that defy logical explanations, one miner, Dennis Durgin, suspected that this mountain had serious potential as a source of gem tourmaline. After years of searching, the mountain has only recently begun to reveal her treasures. Dennis began his journey by leasing Mount Marie in 1993, and eventually purchased the mine and surrounding land in 2002. In the period between 1993 and the end of 2008, Dennis spent countless hours exploring and prospecting the existing quarries and exposed ledges. The total amount of faceting grade gem tourmaline produced during this period could easily be held in the palm of his hand ... needless, to say, a very poor return on the time and expenses invested over the years! The first sign of Mount Marie's potential occurred about 1 PM on June 26, 2009 with the discovery of "Abby's Wedding Pocket" in the original main quarry, the day before his daughter's wedding - and, as one might guess, Dennis was late for rehearsal!. This pocket produced several hundred carats of blue tourmaline, some of which, when faceted into gems, is remindful of the color of fine sapphires. 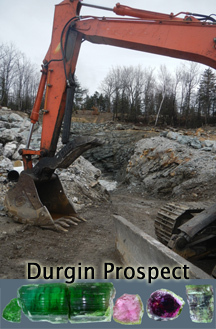 The next significant discovery occurred on May 1, 2011, in the "Durgin Prospect", a small prospect opened in 2006 and located almost 100 yards northerly of the main quarry. The "May Day Pocket", produced more than a thousand carats of gem tourmaline rough in varying shades of bright green and burgundy, along with one notable watermelon "log" recovered in several sections (1 3/4 inches in diameter by about 7 inches long in total, weighing a total of 535 grams). The discovery of gem pockets continued throughout the 2011 mining season, resulting in many wonderful mineral specimens, gem crystals, and faceting grade tourmaline in a broad spectrum of colors. This website has been constructed in part for the purpose of serving as a pictorial documentary of the discoveries at Mount Marie. Dennis, along with the many people that have lent a helping hand in its construction, hope that you enjoy seeing her treasures and join us in the coming years for the journey to come!